IRONIN Sp. z o.o. sp. k.
We're a Polish development agency, on the market since 2011 and growing fast, providing web and mobile applications development, DevOps services, and big data consulting. We’re proud to have built a very experienced team with high coding standards. We deliver IT outsourcing services to small businesses, growing companies and enterprises around the world. Extend your knowledge and experience in the fields of cross-browser compatibility, design principles, front-end best practices, accessibility and usability. Up-to-date with the latest trends, technologies and best practices in front-end development. Competitive salary with B2B contract. Flexible working hours, option to work remotely or from an office. Premium health-care, accident insurance and sport program subscription. Carefully selected projects that offer interesting challenges and opportunities to grow for our team. Your choice of hardware and software. The opportunity to work with cutting-edge technologies and learn alongside a team of experts. Work-life balance, friendly atmosphere and no workstation screenshots. 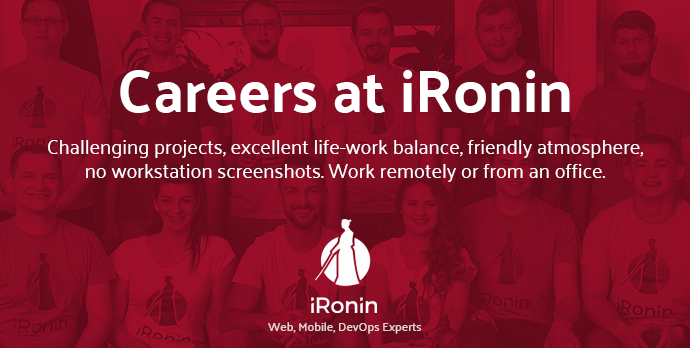 We have an office available to our employees in Rzeszów, and we plan to open more in the Trójmiasto, Warszawa, Wrocław, Poznań and Kraków. Find out what we have to offer and who we are. Don’t forget to check our blog! If you’re interested in this job offer, apply here.